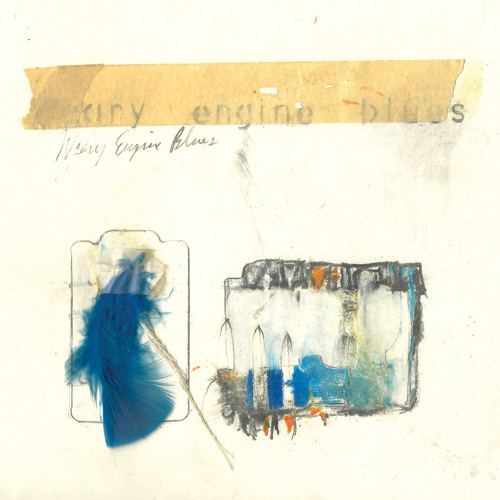 from GRAVE101 - Weary Engine Blues: A Tribute to Jason Molina. Purchase this compact disc and a print by William Schaff here: http://www.graveface.com/graveface-catalog.html From William Schaff: "Back in January of this year, I received a message from a friend of Jason's, Tara Samaha. Like so many of us were, she was concerned. She was concerned for his safety, mental and physical health after receiving an alarming email. She felt he needed a map to help him through these troubled times and then asked that I make him one. I did. Sadly we were never able to land a concrete address for Jason, where we knew he would get the map. I know that he had lost things important to him over the past few years, for various reasons, so I wanted to be sure this got into his hands, and no one else. That said -- sadly -- the map was never delivered to him. Upon learning of his death, the map sat in my studio; it felt cold, and now useless. A guide made for a friend who can no longer see it. Ryan Graveface and I thought of how, thanks to folks like you, we were able to raise a considerable amount of money for Jason's medical bills through sales of the book, From Black Sheep Boys to Bill Collectors. We thought maybe there is still a way for this map to be useful. Not as it was originally intended, a map for one man, but as tool to commemorate this man, and continue to help his family, especially in such dark times as these. 100% of the profits from this print will be going to Jason Molina's family. We now have a chance to give back to the family that gave us Jason, who in turn gave us all so much. Our love goes out to the Molina family, and to the family he built in his dusty road travels." From Aaron Molina: "Very rarely do you run into a star that burns as brightly as Jason. When he is also your brother you are truly blessed. To fans of Jason’s music we want you to know you were the center of Jason’s universe, you meant everything to him. As much as his music inspired others, he was constantly and honestly inspired by you. From the Molina family, from the bottom of our hearts, we want to thank you for the outpouring of support and send our condolences to his fans and friends." From me: With the purchase of the 12.5x12.5 print of the above mentioned artwork, we're including a compact disc of Jason Molina covers. We're calling this collection Weary Engine Blues, named after a piece of artwork by Molina that serves as the cover of this CD release. Click here to view that artwork. Confirmed contributions so far from: John Vanderslice, Mark Kozelek, Hospital Ships, Lucas Oswald, Jonathan Meiburg, Damien Jurado, Dreamend, Brown Bird, Haunt the House, TW Walsh, Phil Elverum, Alisdair Roberts, Scout Niblett, Jeffrey Lewis, Will Johnson, The Wave Pictures, Allo Darlin, Darren Hayman, Will Oldham, Herman Dune and many more amazing musicians. Huge thanks to Hugh Noble and William Schaff for helping get this together so quickly. Please note you cannot just buy the screenprint or the cd. They come as a package and are limited to 525 copies. Know that 100% of the profits are going directly (and immediately) to Jason Molina's incredible family. been a fan forever, so happy to have stumbled across the SC page. thnx gface. kinda reminds me of townes van zandt-waiting round to die. "torn apart room and an empty room"